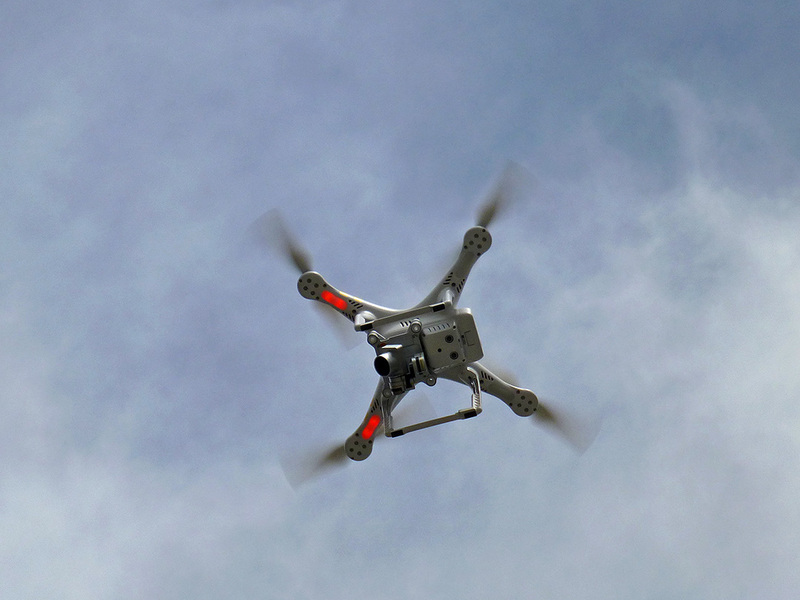 Drones have arrived in Oaxaca; their hummy-buzzy sound is unmistakable. 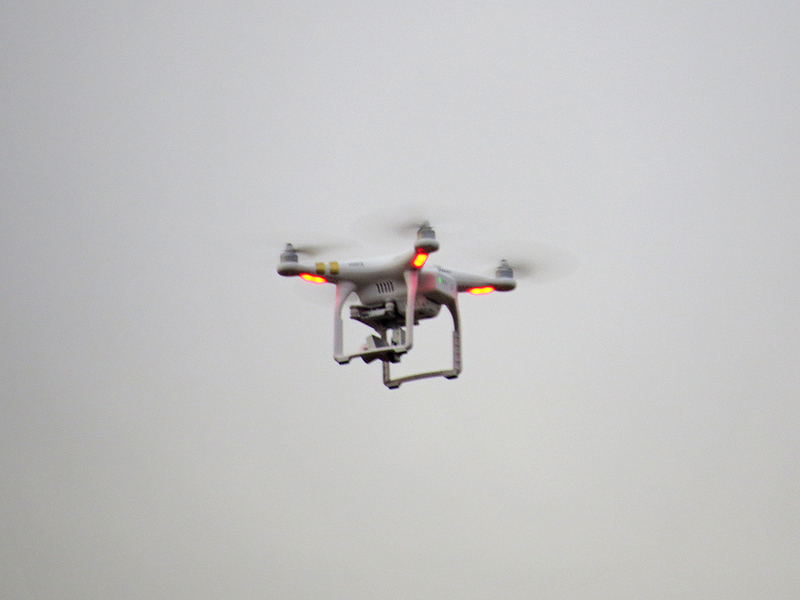 My first “close encounter” of the drone kind down here was 2+ years ago at the Estadio Eduardo Vasconcelos (baseball stadium) when a drone made an appearance at the Lluvia de Estrellas charity home run derby and softball game. Then early yesterday morning, there was that sound again. 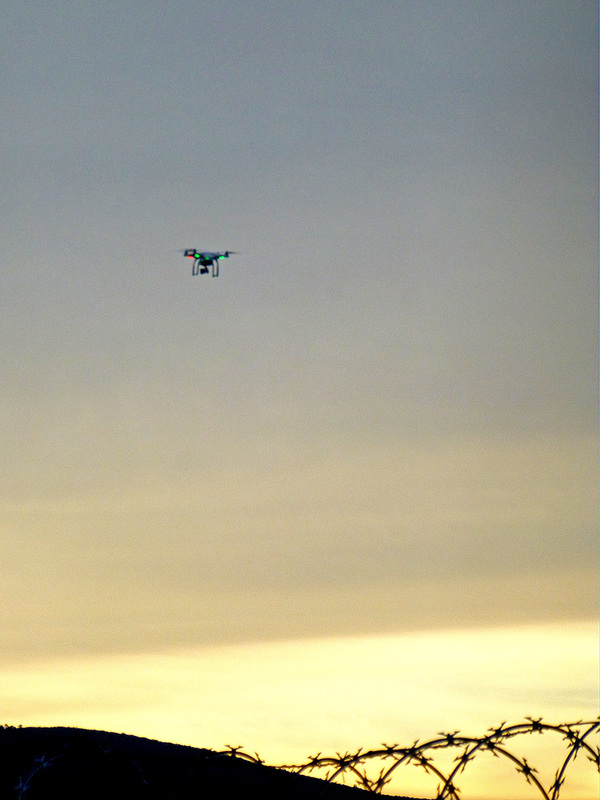 Looking out the window I could see a drone in the distance. Of course, I grabbed my camera and went out to investigate. 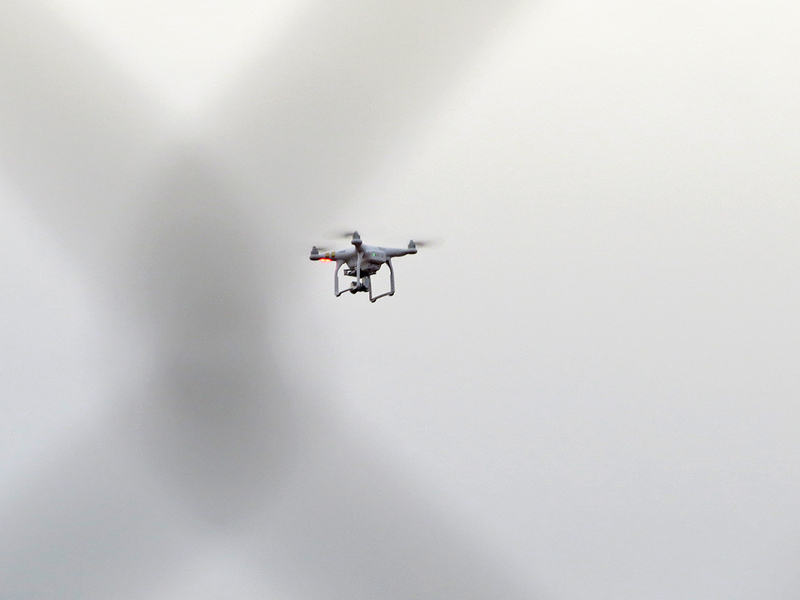 I guess the operator/pilot saw me, because soon the drone was flying toward my terrace, then stopped to pose for several seconds, before flying off. Sheesh, Señor DeMille, I was still in my pajamas and definitely NOT ready for my close-up! 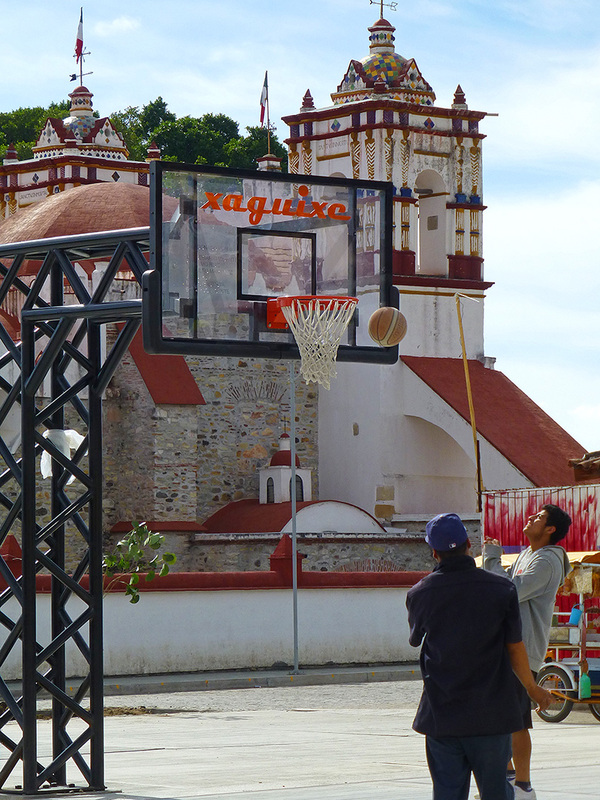 Unlike in wider mestizo Mexico, where soccer reigns supreme, in the Sierra basketball is king. 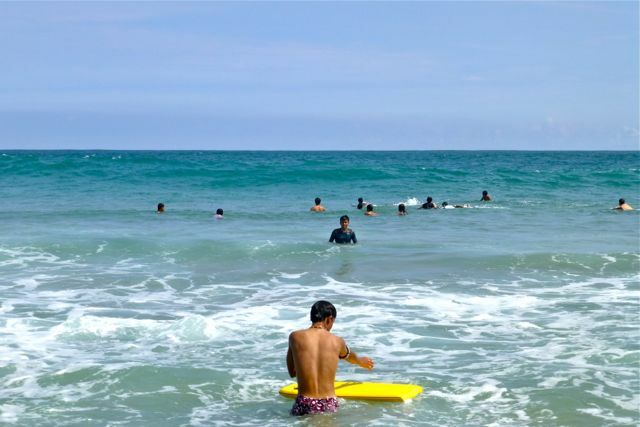 The sport was introduced in the 1930s by president Lazaro Cardenas as a way to bring Oaxaca’s disparate and historically rebellious indigenous groups into the national fold. 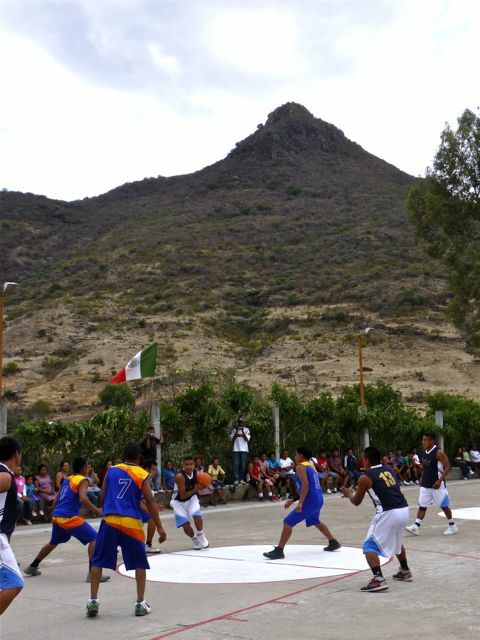 One of several canchas de baloncesto (basketball courts) in Teotitlán del Valle, Oaxaca. Remember yesterday’s Thought for the day clowns? 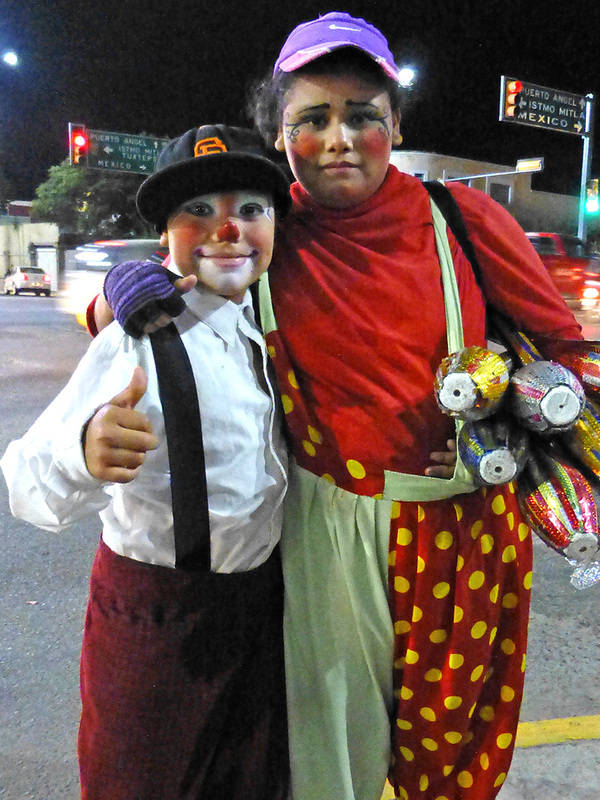 Yikes, I just discovered I’d photographed them two weeks ago outside Estadio Eduardo Vasconcelos (baseball stadium) on my way home from the Lluvia de Estrellas charity home run derby and softball game. Seeing the boy’s San Francisco Giants’ baseball cap, I had to stop them and take a photo. By the way, I was also wearing my SF Giant’s cap and they got a big kick out of that. Gotta love this place! 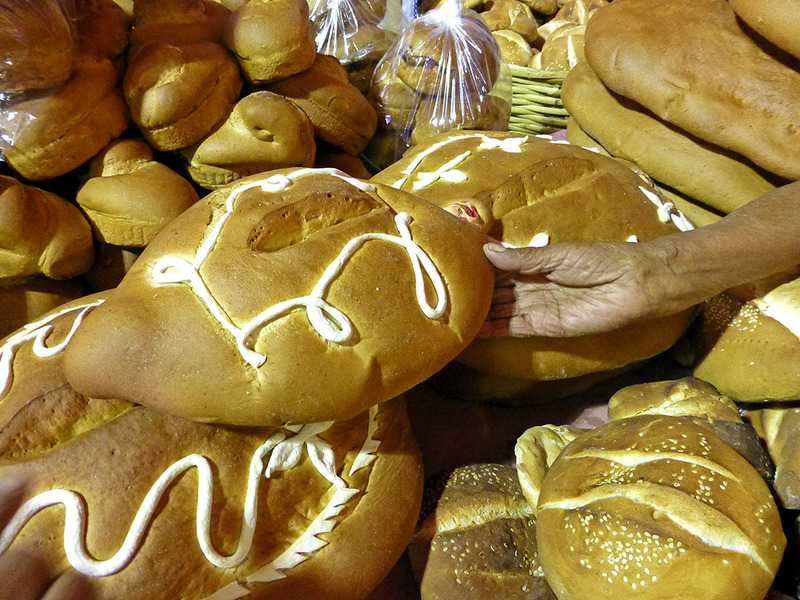 Visits to mercados in the city and Tlacolula have been made. 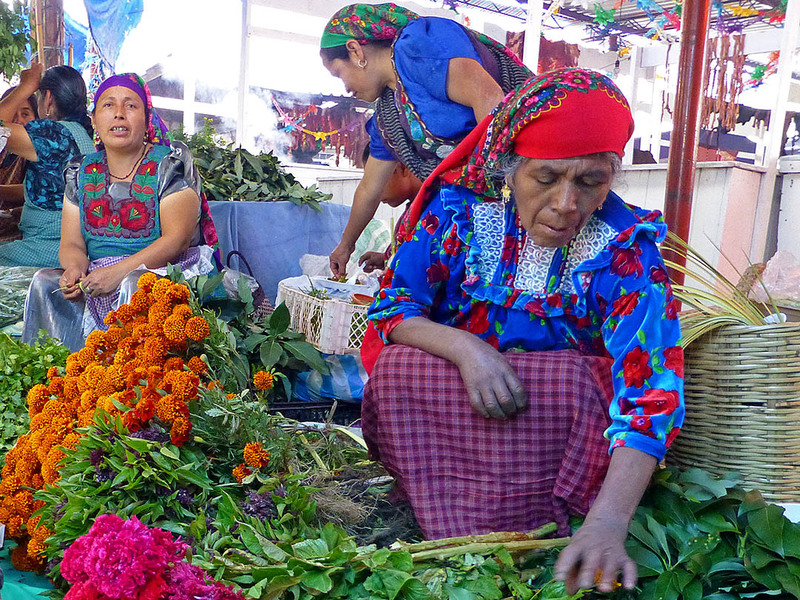 Along with mandarinas and manzanas, cempasuchil and cresta de gallo have been purchased. 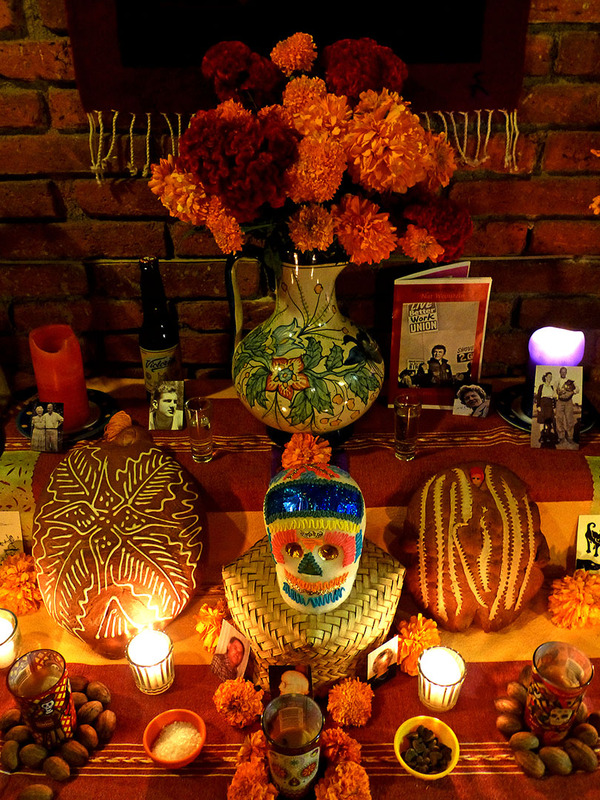 Mezcal and water have been poured, dishes of chocolate and salt prepared, candles brought out, and photos of departed family and friends and a few of their favorite things have been collected. 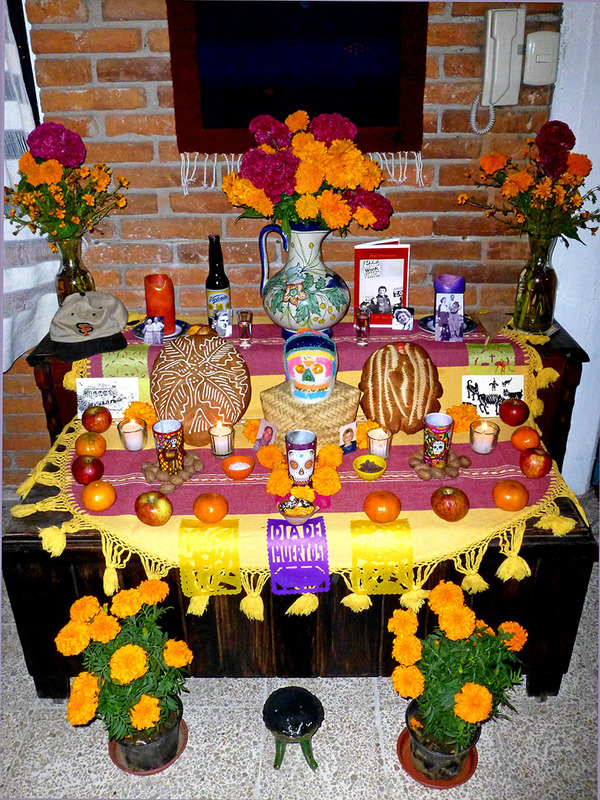 Yesterday, it was time to prepare my ofrenda. 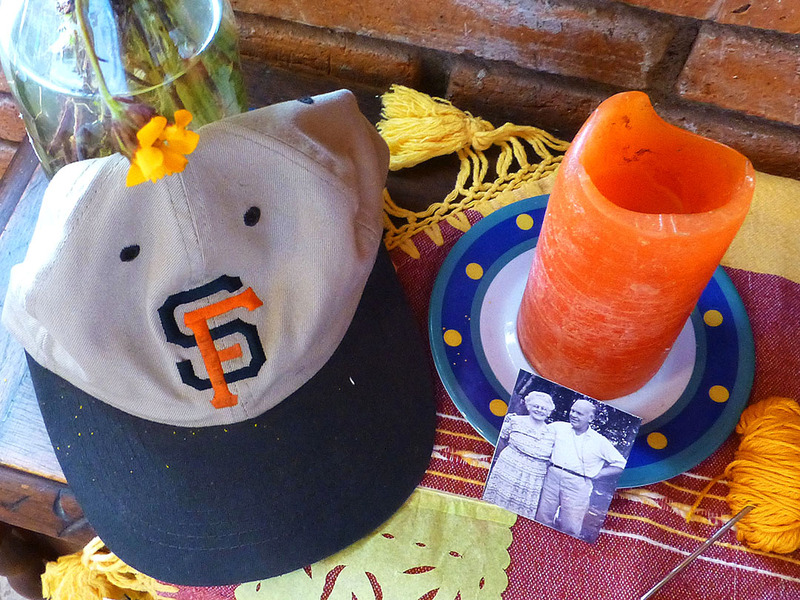 And we offered our silent — and sometimes not so silent — prayers to the baseball spirits to bring victory to the San Francisco Giants in game 7 of the World Series. The spirits listened!!! 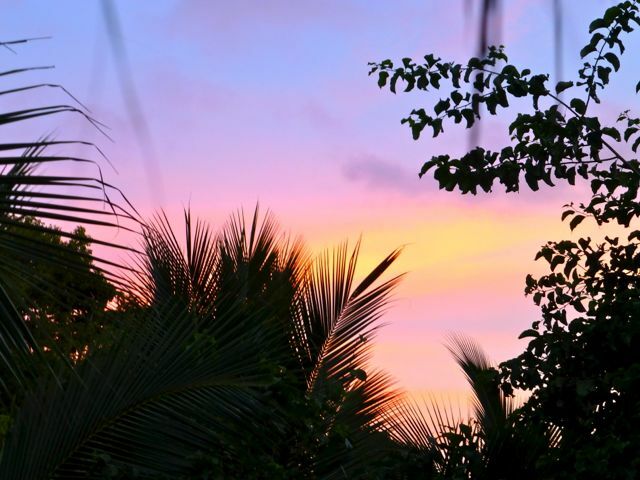 Thinking of you, grandpa…. Tonight, from the valley where corn was first cultivated, I’ll be watching my San Francisco Giants play game one of Major League Baseball’s, 2014 World Series. 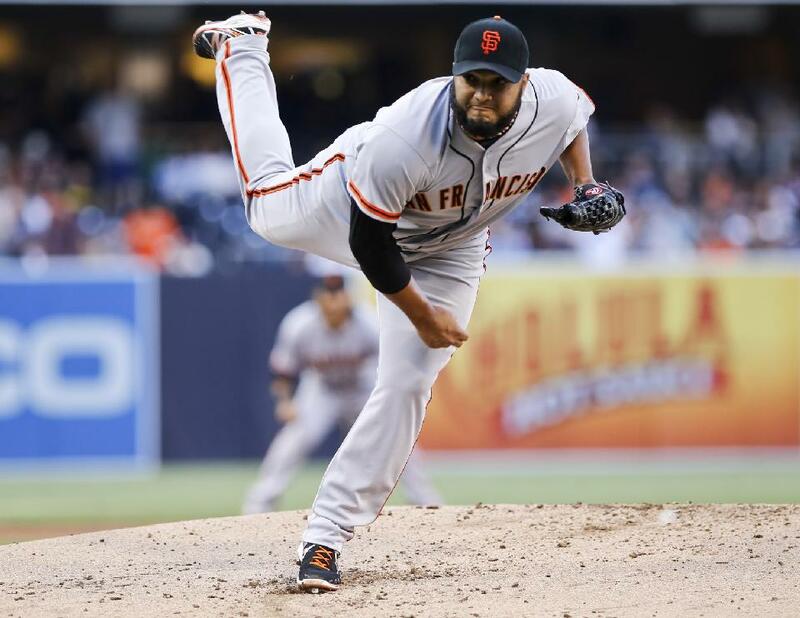 I was amazed to discover that one of San Francisco’s ace relief pitchers, Yusmeiro Petit, the Giants’ do-everything man, played for the Oaxaca Guerreros in 2011!!! The Guerreros, a Triple-A team in the Mexican League play at Estadio Eduardo Vasconcelos, within walking distance (albeit, a long walk) from my apartment. 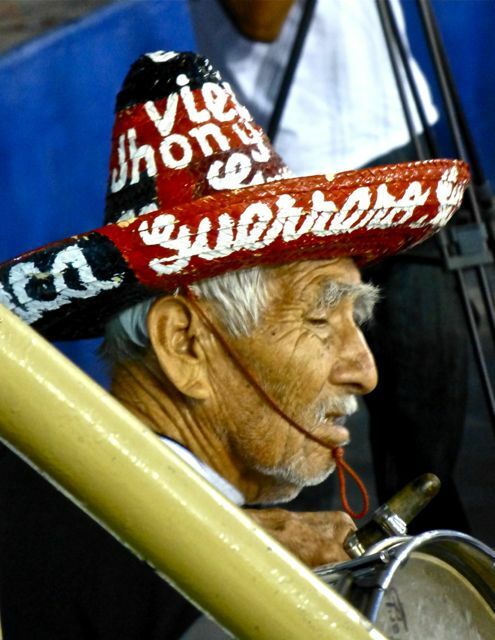 I attended several of the Guerreros’ games in 2011 and, who knows, maybe I saw him. ¡Felicidades Yusmeiro Petit y vamos Gigantes! 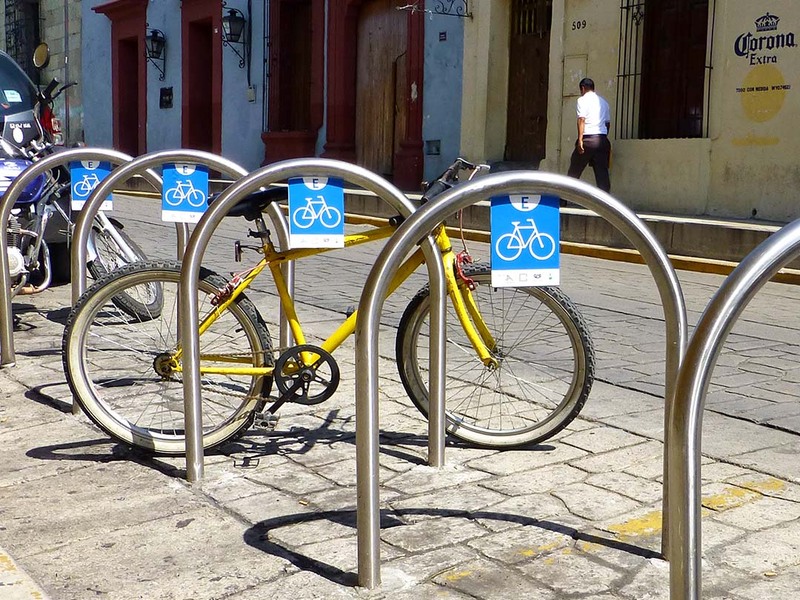 In the 5+ years that I have been living here, Oaxaca has become much more bike friendly. It’s a good thing too, because traffic, even without the bloqueos (blockades), has gotten much worse. 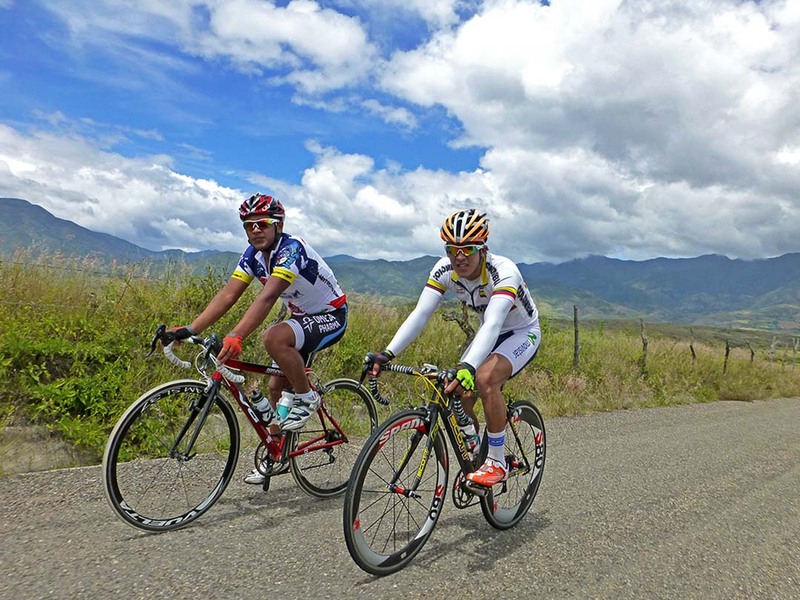 I mentioned last Sunday we had to detour due to a bike race and passed these spandex warriors, out for a Sunday ride. In the city, the narrow streets, often with double-parked vehicles, weren’t designed for a growing middle class and their desire for cars. However, poco a poco (little by little), accommodations are being made to achieve a modicum of safety and peaceful co-existence between cars and bikes. Bike racks began appearing in early summer. 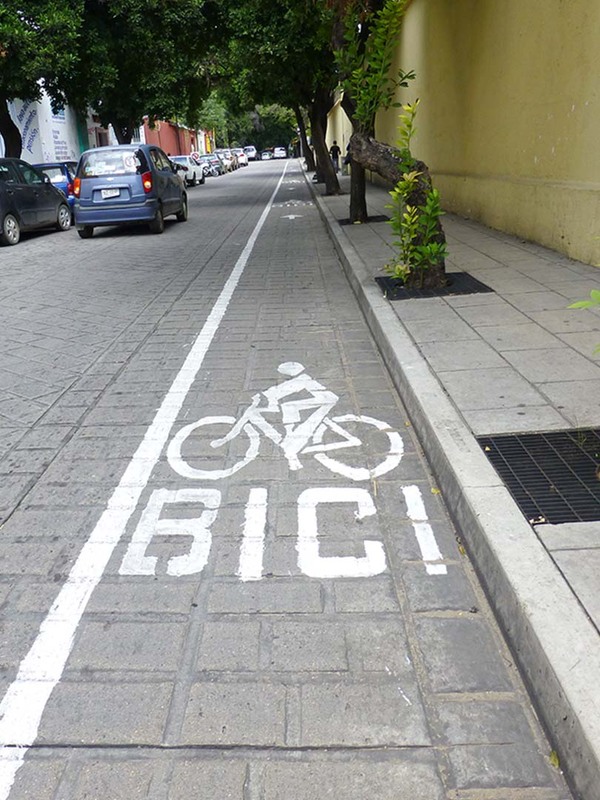 And, much to my amazement, a couple of weeks ago, I saw actual bike lanes. Wonders will never cease!!! However, I’m not exactly sure what someone is trying to say, here. (Update: thanks to some helpful blog readers, I have sadly been informed, “a white bike is put where someone has been killed on a bike. 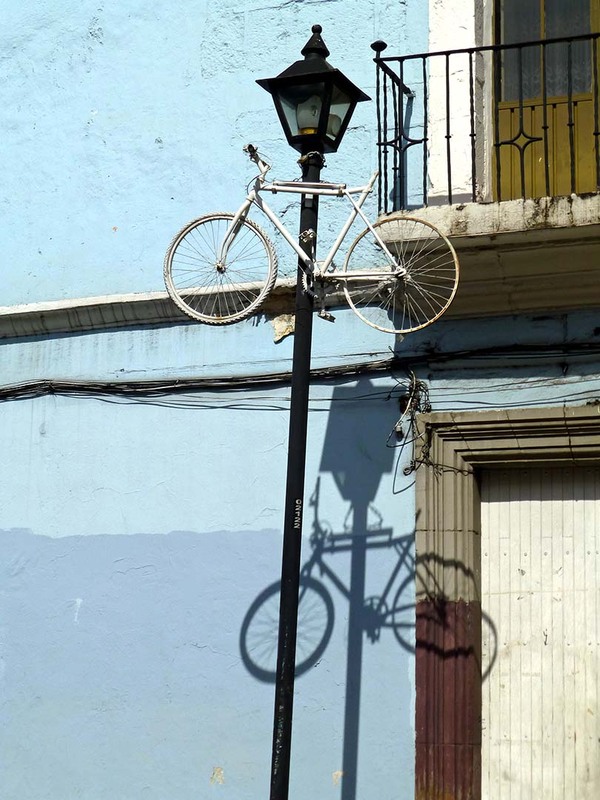 They are called “ghost bikes”. 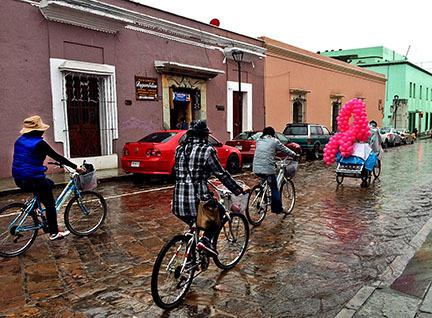 Bike on, mis amigas y amigos… even in the rain… Mother Nature will thank you! If you are in Oaxaca and like to ride, you might want to check out “Oaxaca es más bella en bicicleta” (Oaxaca is More Beautiful on a Bicycle) on Wednesdays and Fridays from 9 PM to 10:30 PM. They meet in front of Santo Domingo church. 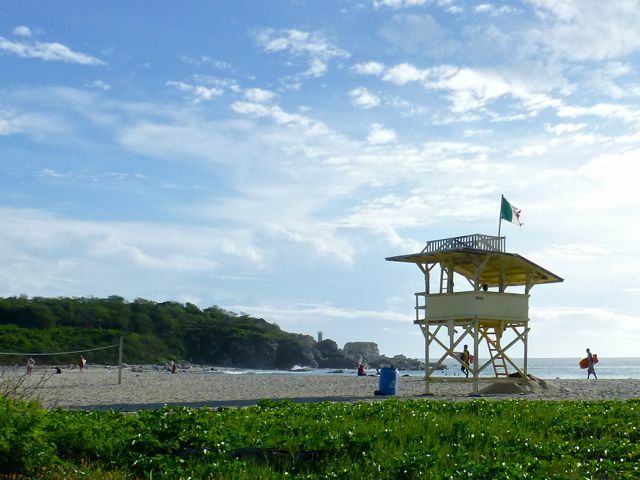 There is also a Sunday ride from the city to Santa María del Tule. Update: Larry G. reminded me that OaxacaMTB.org is a great resource for those interested in mountain biking in Oaxaca. What a game; three goals in 10 minutes in the second half!!! Another thrilling win by El Tri advances Mexico to the next stage in World Cup 2014. 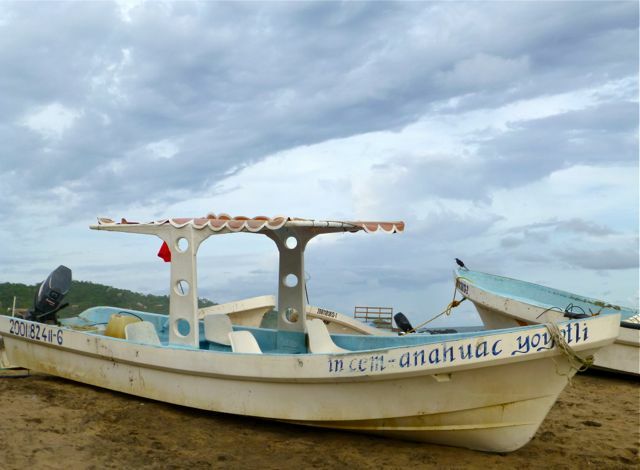 They struggled and needed a little help from their “friends” in el norte to even play in Brazil. However, against all odds, this team exhibits a gutsy and tenacious heart and soul that can’t help but have people rooting for them — much like the country of Mexico, itself. Francisco Goldman wrote an op-ed in yesterday’s New York Times. 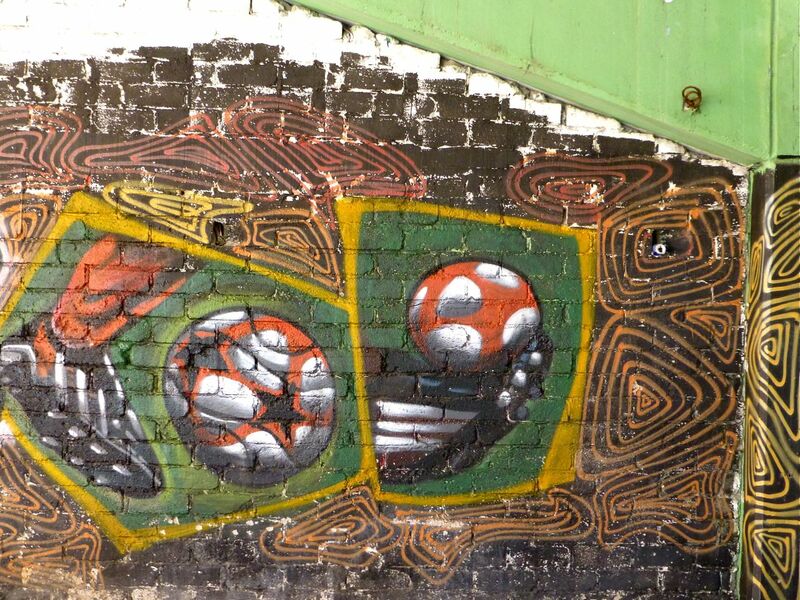 His article, “Fooling Mexican Fans,” relates the current politics of Mexico, the “bread and circuses” diversion of the World Cup, and the notion that El Tri might exemplify all that is inspiring and hopeful in the Mexican national character. 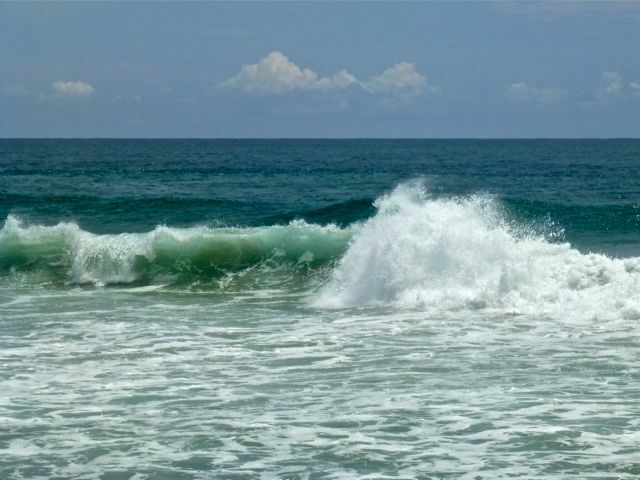 To debate and pass laws that could open Pemex, the nationalized oil company, to foreign investment, the Mexican Congress scheduled legislative sessions from June 10 to 23, dates precisely coinciding with you know what. Final passage might be pushed back, but it originally looked like it was supposed to happen on Monday, when Mexico plays Croatia to decide which country advances to the elimination rounds. As I wrote previously, Mexicans have been Expressing the outrage since last year, when Mexico’s newly elected president Enrique Peña Nieto (initials EPN), from the PRI party, first made the Pemex energy “reform” proposal. 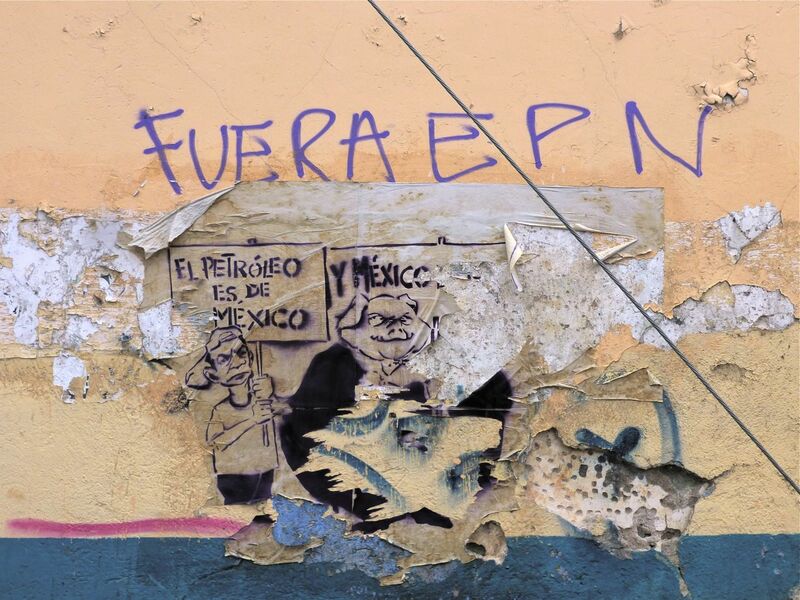 Graffiti seen on a wall south of Oaxaca’s zócalo, May 23, 2014. There has been much talk lately about the way the style of soccer teams manifests national characters. I don’t know if that’s true. But when I look at the Mexican team which, after barely even qualifying for the World Cup, has been playing so well, I see a team without stars — a gritty, hard-working, pretty humble, resourceful, creative, disciplined, joyous, friendly-seeming group of players who seem to be learning to play the game as it is meant to be played. These are values that we see enacted and re-enacted all over Mexico, and in Mexican communities elsewhere, every day. Someday Mexico will get another chance to vote the PRI away and to restart the long process of building the country from the ground up. It could do worse than take some inspiration from its national team. Absolutely, those are the values I, too, see exhibited in Mexican communities both in Mexico and the US. There is hope for the future — and not just on the pitch! I encourage you to read Goldman’s op-ed in full. In the meantime, Mexico vs. Netherlands on Sunday at Estadio Castelao Forteleza. ¡¡¡ VAMOS EL TRI !!! 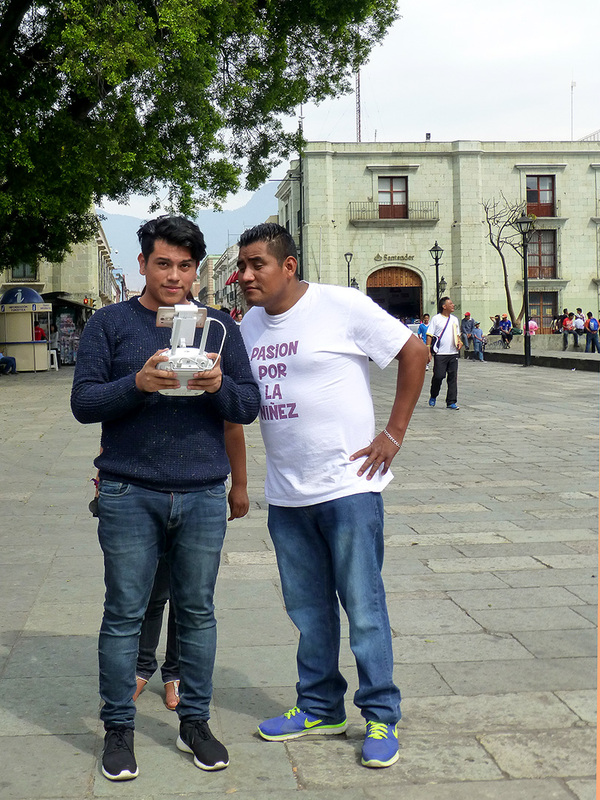 This afternoon, the headline of Noticias announced, “Oaxaca paralyzed by Mexico-Brazil match.” It goes on to report that zócalo restaurants offered drink promotions and there were cries, sighs, applause, and prayers as people were glued to the TV monitors and their mobile devices. I, too, have caught World Cup fever. I’m relatively new to fútbol/soccer (my sons played American football), but began learning during Mexico’s march to the Gold during the summer Olympics two years ago. Still in California, today I was one of the Millions of U.S. Soccer Fans … Cheering for Mexico. Friday, I watched Mexico’s 1-0 (should have been, 3-0) defeat of Cameroon by myself, albeit from the comfort of my younger son’s living room (he was at work). 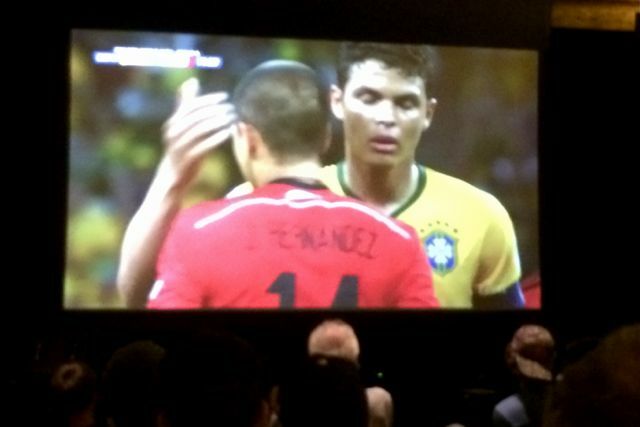 However, for today’s match against Brazil, I headed to Sweetwater Music Hall and their ginormous screen. It was a full house and cries, sighs, applause, and prayers were evident there, too. I’d say the crowd was 60-40 for Mexico, though some of the Brazilian contingent was particularly vocal. Our (El Tri’s fans) hopes rose when Chicharito FINALLY came into the game, but in the end, the score remained nil-nil. No scoring? 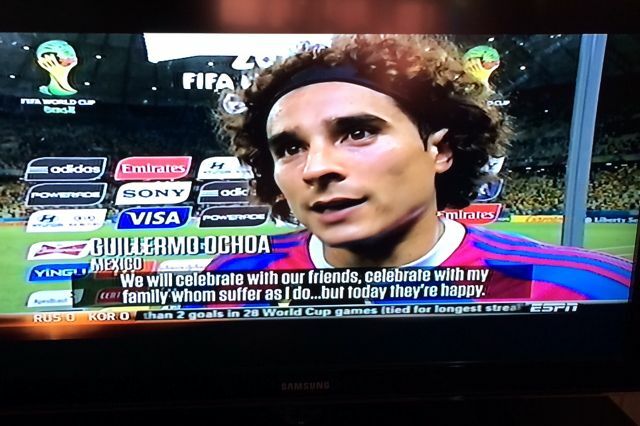 No, but it was a great game and Mexico’s goalkeeper Memo Ochoa played the game of his life. Immediately following the game, Memes Hail Guillermo ‘Memo’ Ochoa’s Remarkable Saves for Mexico vs. Brazil. I was going to try to add to it, by putting his face on an airborne Moctezuma during Danza de la Pluma, but I don’t have Photoshop on this computer. Anybody? Chris??? Yesterday, we returned to Teotitlán del Valle to join in their annual Día de la Santa Cruz hike up El Picacho, the sacred mountain that watches over this incredibly special pueblo. This year, instead taking the route up the mountain directly from downtown like we did last year (and it kicked our a$$), we drove to the presa (dam) and headed up a surprisingly well-marked trail from there. A symphony of cicadas (cigarras or chicharras, en español), serenaded us as we climbed, young people passed us, and Templo de la Preciosa Sangre de Cristo, off in the distance, got smaller. However, after more than an hour, we sighted our first pack burro (they bring up the food and drink) and knew we had almost reached our destination. We were welcomed at the top by the family hosting the gathering and given cups of agua de jamaica — just what the doctor ordered! There were even more people than last year, music blared from large speakers the aforementioned burros must have carried up the mountain, a new cross had replaced the one that had been hit by lightning last year, and, of course, the views were breathtaking. But, with spectacular views in all directions, why was most everyone looking down toward the road from the village to the presa? Wow, runner and SF 49er fan! Not all runners are tall and lean. His parents raised him well. And so was this gal, who was on her way up as we were coming down. Muchisimas gracias, yet again, to the people of Teotitlán del Valle for another unforgettable experience. Many of you may not know that Oaxaca has a Minor League baseball team, the Guerreros de Oaxaca, a Triple-A team in the Mexican League. They play at Estadio de Béisbol Lic. 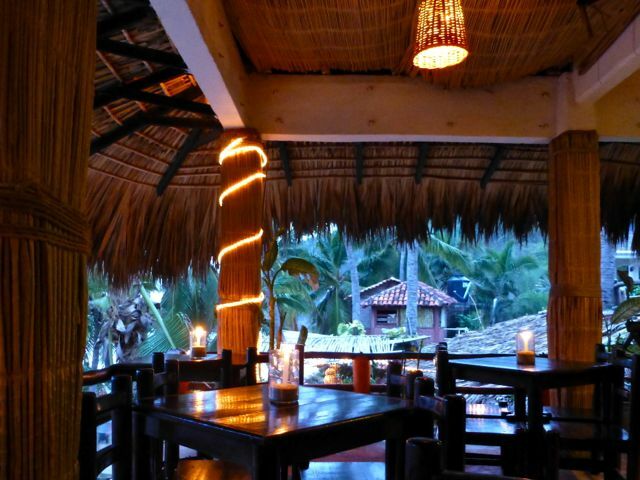 Eduardo Vasconcelos, right off the Pan American Highway, and most seats look out onto the sierras to the east. Tickets are inexpensive (women, seniors, and children usually pay even less), a friend insists it’s a great place to learn local Spanish swear words, and it’s a mere 25 blocks from Casita Colibrí (definitely within walking distance). However, until Tuesday night, I hadn’t been to a game in almost three years. 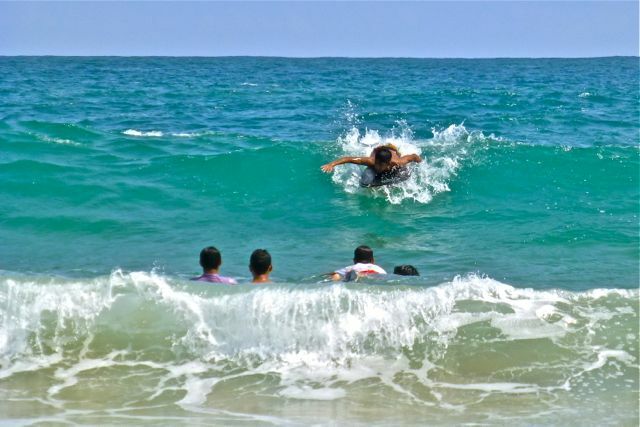 The Guerreros were playing the Vaqueros Laguna from Torreón, Coahuila AND women got in free! Besides the action by the players on the field, there were cheerleaders. What can I say??? They certainly know how to toss their hair! Despite the free ticket promotion for women (and men only paid 25 pesos), the stands were about an eighth full. However, this guy and his drum walked up and down the main aisle, drumming up fan support. Unfortunately, in the bottom on the second inning, the rain that had been threatening, finally came. 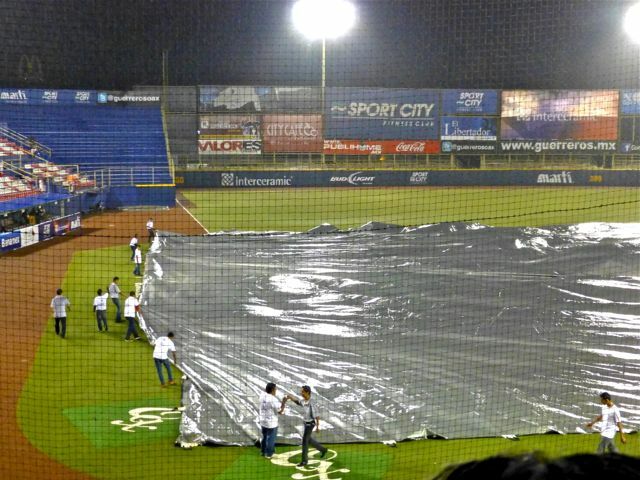 The game was halted, the players headed into their respective dugouts, and the ground crew pulled out the tarp. It was already 8:15 PM, and we succumbed to being “fair weather fans” and left. 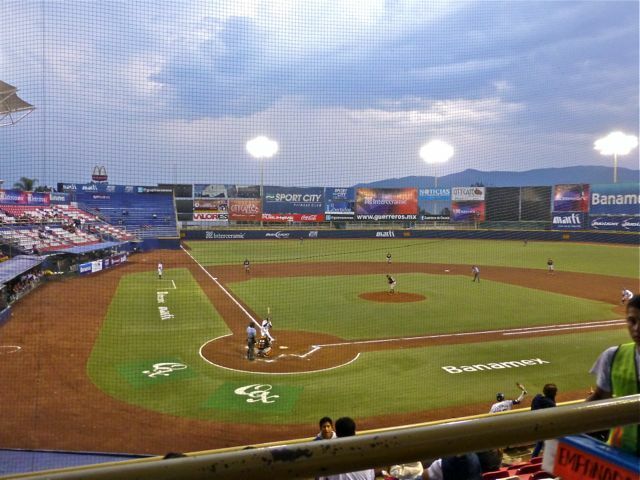 The game eventually resumed and the Guerreros lost, 2-5, BUT they won the next night, 12-5, and are currently in third place in the Mexican League Sur. 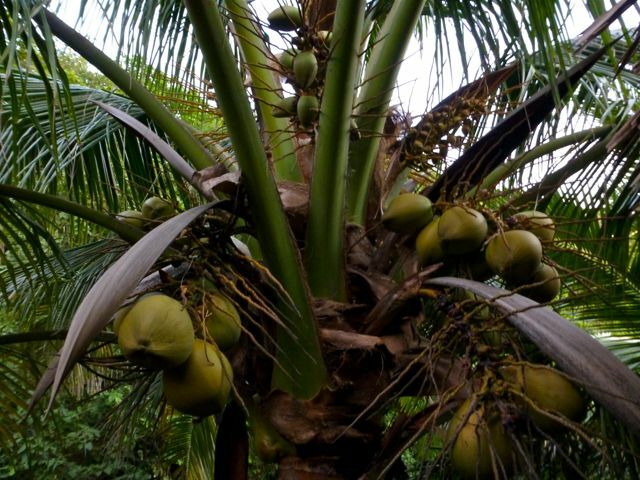 I will return… THIS season! Two young Triqui basketball teams qualified to participate in the International Tournament YBOA (Youth Basketball of America) in Orlando, Florida this month. 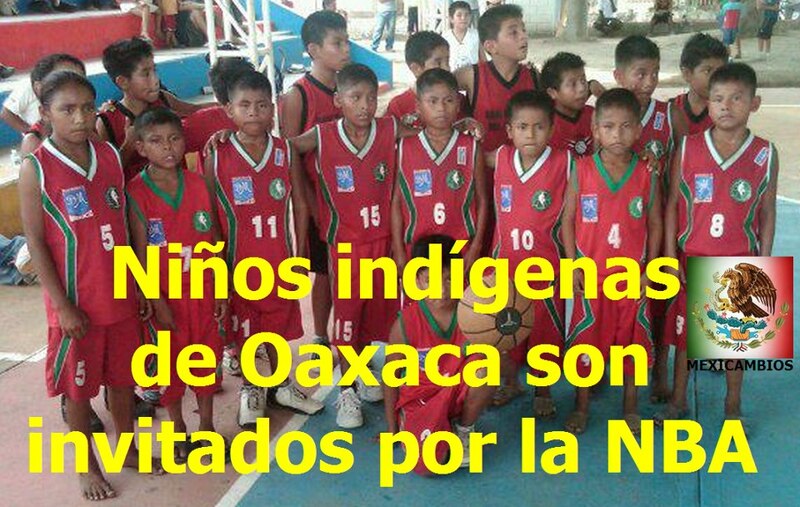 They are from the Academia de Baloncesto Indígena México (ABIM), an athletic project founded by professor Sergio Zúñiga, with the mission of “rescuing the youth of the Triqui communities of Oaxaca from the extreme poverty and violence that they live in… to better the lives of these kids through sports and education.” Read their story, including why they play barefoot, HERE. The tournament has ended and, though they did not win the tournament championship, they won hearts and (one can only hope) minds. To me, these young ambassadors were winners in the important ways that matter. ¡Felicitaciones! 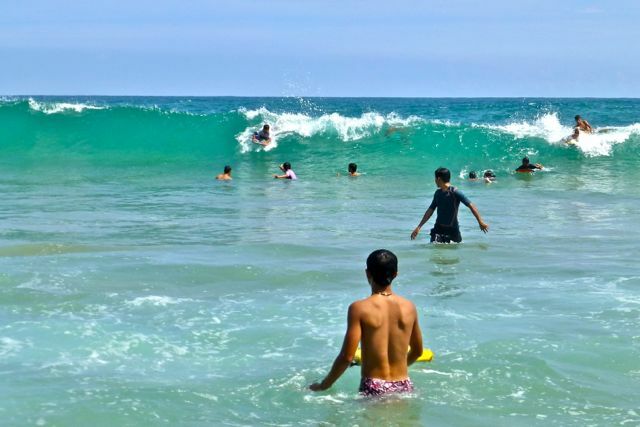 For video of the team playing and information about the documentary that is being made about these kids, take a look at the blog, Mexico’s Barefoot Champions. 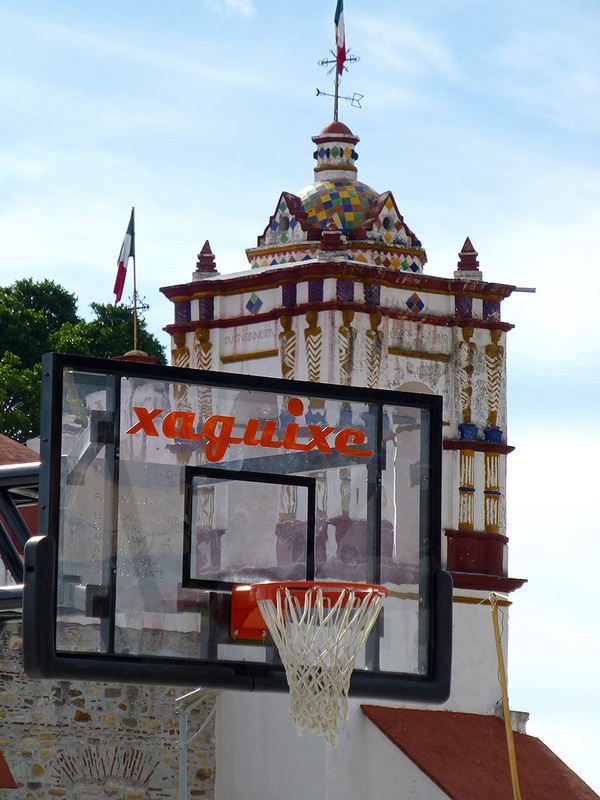 Basketball is big in Oaxaca and was big news to me! 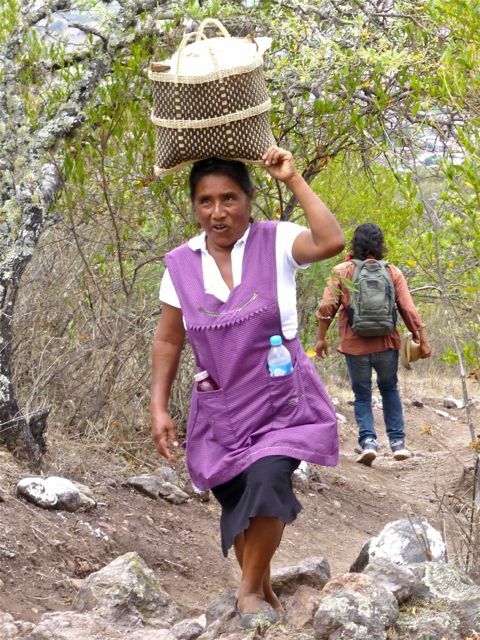 In Teotitlán del Valle, located in the valley Oaxaca, there is a tradition of climbing El Picacho on Día de la Santa Cruz (May 3). I’d also heard celebrations also included an annual basketball tournament. Sure enough, the sound of a play-by-play announcer, ref’s whistle, and buzzer occasionally floated up to our perch on the top of the mountain. 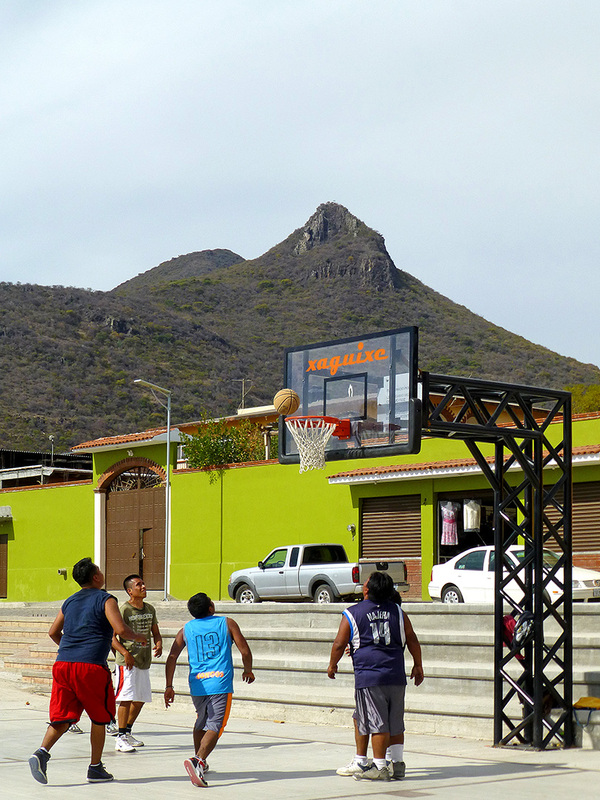 When we descended El Picacho via a different route, we came to a basketball court a few blocks from the village center, and an intense game in progress, with other teams waiting in the wings — in this case, the road! 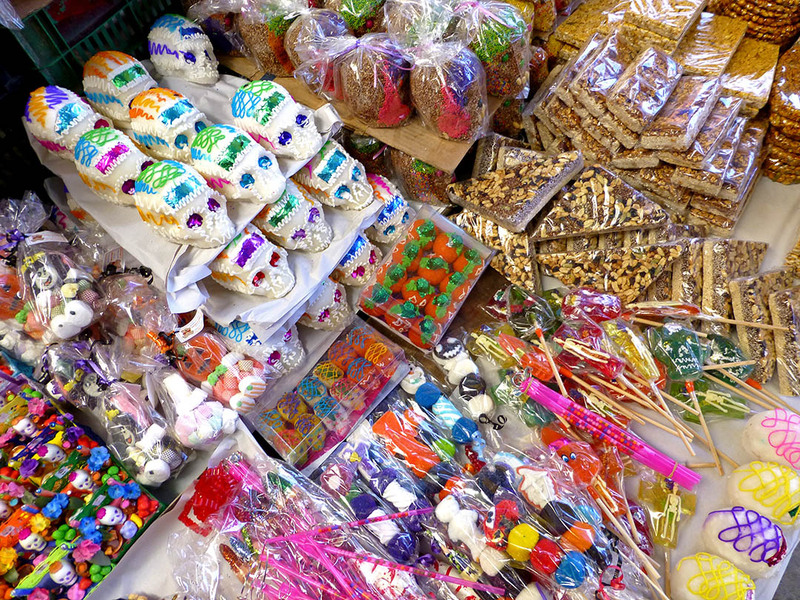 Eight days later, we drove up into the Mixe in Oaxaca’s Sierre Norte for the Fiesta de Mayo in Santa María Tlahuitoltepec. 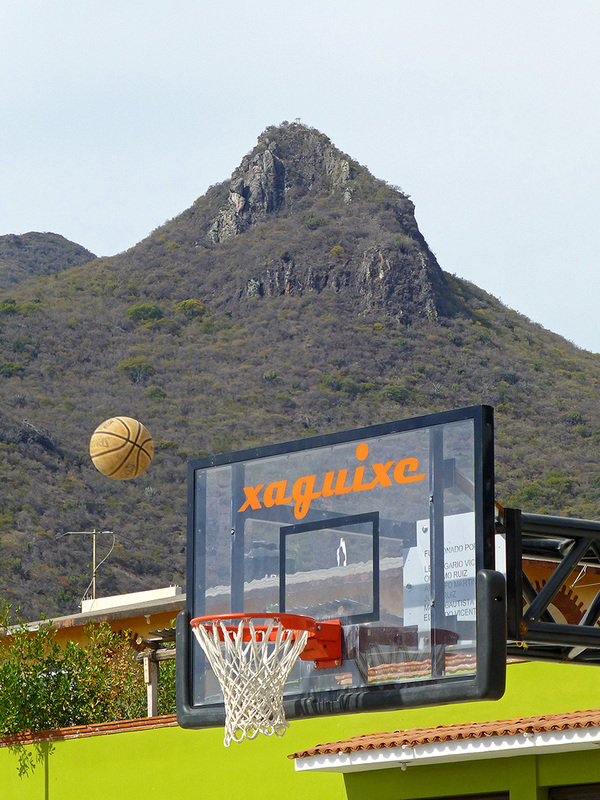 Once there, we were directed to a basketball court (did we hear correctly?) at the center of town — the mercado off to one side; church on another side; municipal buildings off to another. We had expected folkloric dancers or ceremonial presentations, but were surprised to find a basketball tournament in progress. It eventually ended and the expected dancing began. 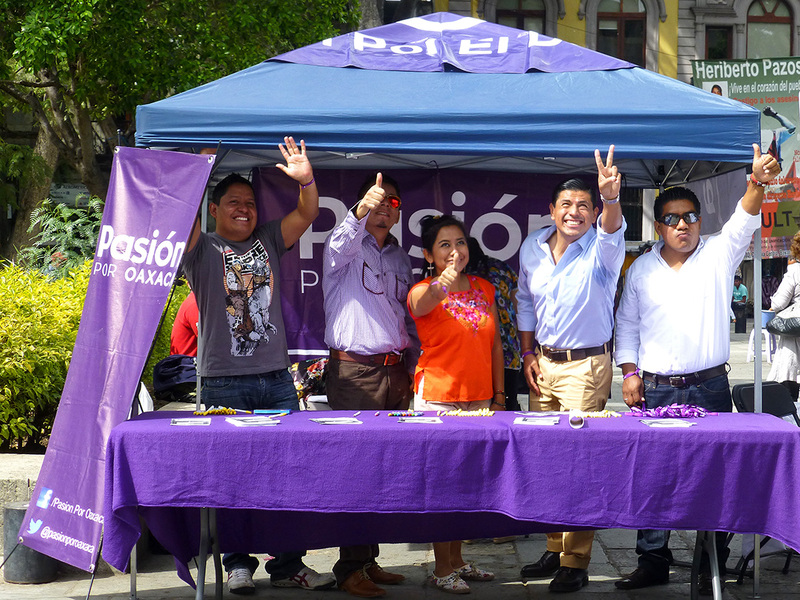 Any proper town in Latin America has a church facing a plaza — except the towns of the Sierra Norte region of Mexico, where Jorge Santiago is from. It may not be Oaxaca, but there is some major league urban art celebrating Major League Baseball’s 2012 World Series champion, San Francisco Giants. The mural, by the Ex-Vandals, currently can be seen at Columbus at Union Street in San Francisco’s, North Beach neighborhood. But, did the city’s Planning Commission have to deface the mural with its Notice of Public Hearing? Couldn’t they have posted their notice in a more discrete location? Honestly, have they no respect?! !